A week filled with pre-parties, viewing parties, and the Emmy’s themselves, Emmy’s week is like one big red carpet through Los Angeles. 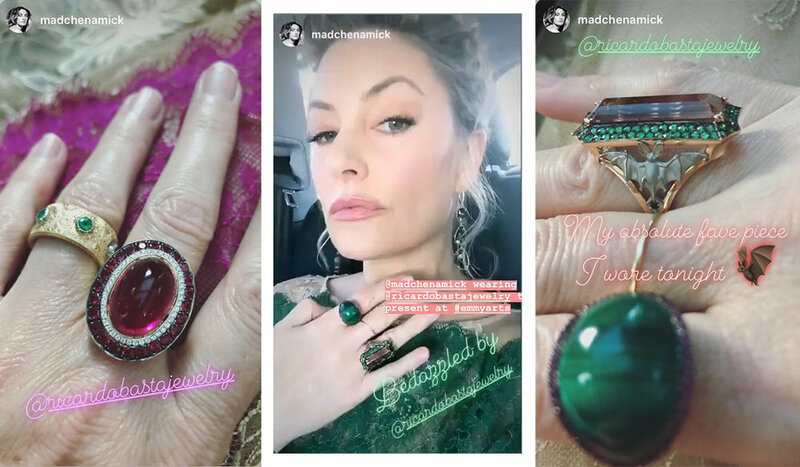 This means tons of red carpet looks to fawn over, and Madchen Amick was at the top of our list, wearing Ricardo Basta Fine Jewelry throughout the week. Her first look took our breath away in a hot pink and green lace dress, made for our Tourmaline slice earrings, and four of our favorite rings - our Emerald and Gold band, Pink Tourmaline, Diamond and Ruby ring, Pink Tourmaline and Tsavorite bat ring, and our Malachite and Ruby ring. Madchen’s second look was black, low-cut, and gorgeous all over. Paired with our Triple Pearl ring and Pearl earrings, we couldn’t get enough of this classic bombshell presence. Peep Madchen Amick’s Emmy Ricardo Basta Fine Jewelry looks below. Which look do you love most? 15.84 carat cabochon Rubellite Tourmaline, surrounded by .21 carats of Diamonds, surrounded by 1.64 carats of Rubies, set in 18k Yellow Gold. Fresh Water and Tahitian Pearls, decorated with .17 carats of Diamonds.